Phelan is using Smore newsletters to spread the word online. 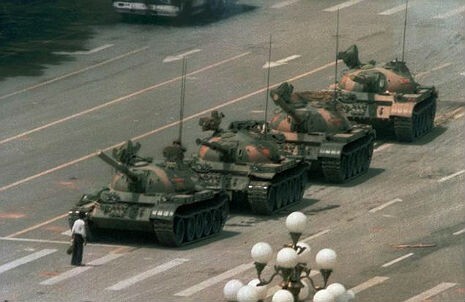 The Tiananmen Square Massacre was a merciless killing spree by government troops against protesters. Chinese troops paraded through the square killing protesters on sight giving no mercy. “Tiananmen Square massacre takes place.” 2013. The History Channel website. Oct 28 2013, 12:25 http://www.history.com/this-day-in-history/tiananmen-square-massacre-takes-place. Hu Yaobang was a reformist who supported economical and political change of the government. He was loved for his strong leadership and how he represented the people in the government. Hu Yaobang died April 15,1989. Six days after his death 100,000 students went to pay their respects at the Tiananmen square. The chinese Government didn't allow the memorial march but people went to march anyway. Acording to the website called "This Day in History", " Students from more than 40 unversities began to march to Tiananmen square on April 27 “Chinese students begin protests at Tiananmen Square.” 2013. The History Channel website. Oct 30 2013, 12:36 http://www.history.com/this-day-in-history/chinese-students-begin-protests-at-tiananmen-square. The Government declared martial law and then troops and tanks were called to spread over the protesters. A large number of people blocked the armys advances including the man above standing infront of one of the tanks. Acording to the website called "This Day in History", " On june 3 with negotiaions to end the protests stalled and called for democratic reforms escalating, the troops recieved orders from the Chinese government to reclaim Tiananmen at all costs. Troops started to kill everything in its path more than a thousand people died “Chinese students begin protests at Tiananmen Square.” 2013. The History Channel website. Oct 30 2013, 12:36 http://www.history.com/this-day-in-history/chinese-students-begin-protests-at-tiananmen-square. How did this massacre change the world? This massacre changed the world for the better. It made people see how standing up for what you believe in can make a difference.